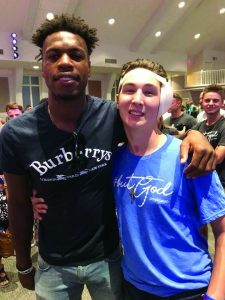 Buddy Hield, left, welcomed Caleb Freeman back at a special worship service at Newcastle, First. NEWCASTLE—Caleb and Clayton Freeman are avid sports fans and especially love basketball. They both attended basketball camps at the University of Oklahoma (OU). A couple of years ago, during camp at OU, Clayton, 15, approached All-American and current NBA player Buddy Hield, asking him if he could help both him and his brother with shooting techniques. Hield was willing to meet with them sometime and gave Clayton his cellphone number. When the Freeman brothers went home to tell their father, Pastor Jeremy Freeman of Newcastle, First, that Buddy Hield was going to help them with their shooting, Jeremy did not believe them. “There’s no way you got Buddy Hield’s number!” he exclaimed. “I promise you I did!” Clayton replied. Still skeptical, Jeremy sent a text to the number Clayton received. Hield promptly replied and confirmed he would meet both Caleb, 16, and Clayton at the church gym. This was the beginning of a close relationship between Hield and the Freeman brothers. Drafted as the sixth overall pick in the 2016 NBA Draft by the New Orleans Pelicans, Hield eventually was traded to his current team, the Sacramento Kings. Even with the rigorous schedule Hield has as a professional athlete, he still remains close to the Freemans, and his friendship has been meaningful in the last 10 months. Since then, Caleb’s story has been shared countless times through numerous news sources and social media. 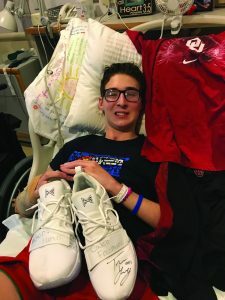 The Facebook page “Pray for Caleb” consistently offers updates on Caleb’s progress, as he has gone through more than nine months of rehabilitation with stops at the University of Oklahoma Medical Center, Craig Hospital in Colorado and Quality Living Incorporated, a post-hospital residential rehabilitation center, in Omaha, Neb. On Aug. 26, Newcastle, First celebrated Caleb coming home. The Sunday morning worship time featured Jeremy leading a question-and-answer session with Caleb. Also in the crowd was Buddy Hield. He happened to be in town and did not want to miss this celebration. Jeremy said Hield has attended services at Newcastle, First in past occasions. He also believes Hield has made a profession of faith in Christ, mentioning he knows Hield’s mother, Jackie Swann, has been outspoken in her Christian faith. Trae Young sent Caleb the shoes Young wore while tying the NCAA single-game assist record. Young wrote on the shoes “God’s Hands” and “Caleb Freeman” prior to the game. An article written in 2016 by Oklahoman sports reporter Jenni Carlson mentioned there have been numerous moments when Swann would pray with her son over the phone. While attending OU games when Hield played with the Sooners, Swann would pray almost as often as she would cheer, Carlson reported. And recently, Hield told Caleb he was praying for him. He sent a video to Caleb early in his rehabilitation. Another significant moment involving Caleb and Sooner basketball players, Trae Young, who was the fifth overall pick by the Atlanta Hawks in the recent NBA Draft, sent Caleb the shoes Young wore when he tied the NCAA single-game record for assists. Young wrote on the shoes “God’s Hands” and “Caleb Freeman” prior to the game. Jeremy said he appreciates the encouragement both Hield and Young have offered to Caleb. He especially appreciates how both players shared their faith in both their words and actions. Jeremy said Hield consistently recites Phil. 4:13 “I can do all things through Christ who strengthens me” to Caleb, and Young sharing on social media about Caleb had a major impact. The “Pray for Caleb” Facebook page continues to provide frequent reports at www.facebook.com/prayforcalebfreeman.